Here am with a one pot meal - Mushroom rice / Mushroom pulao / pilaf / pulao recipe. Mushroom, as i always say is my favorite veggie which i love to add in most of my veg dishes. 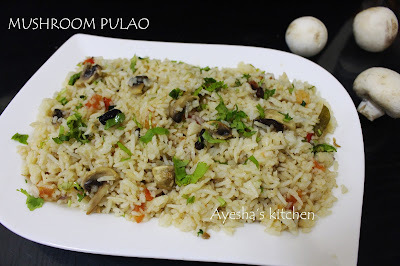 Mushroom pulao is a very flavorful one pot meal which is a perfect dish for lunch box too. The preparation of this pulao is bit different from regular pulao. Stir fried buttery mushrooms are added only after the rice is 90% done. The use coconut milk (thin) instead of water to cook the pulao makes this pulav more flavorful. 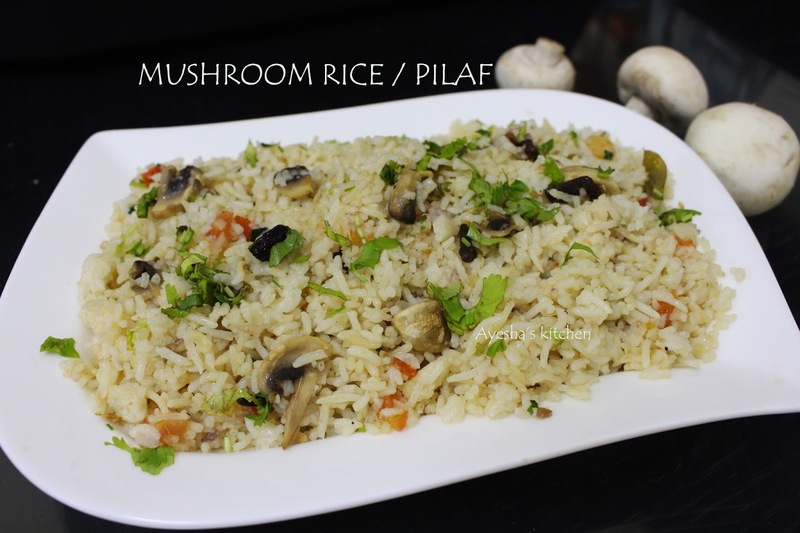 Here is the recipe showing how to make easy pulao with mushroom / how to make veg pulao / how to make mushroom rice. Try this and enjoy. Wash and soak the rice for 15 minutes and drain it, set aside. Now cut each mushrooms into 4 slices and set aside. Heat a pan with butter and toss the sliced mushrooms well in the butter for 2 minutes. Then add chopped tomato, pinch of salt and toss with the mushroom for 1 minute on high flame, set aside. In a deep bottomed vessel, heat some ghee / oil. When hot, add cardamom, cloves, star anise, cinnamon, bay leaves and saute for a while till fragrant. Add the cleaned and drained basmati rice / long grain rice to it. Mix well. Cook for 5 minutes in a medium flame. Stir occasionally. Meanwhile add the coconut milk ( we took 1 cup of basmati rice. SO WE NEED 1 3/4 CUPS OF WATER (coconut milk)) in another vessel and heat it until warm. Now pour this thin warm coconut milk and mix well with the rice. Add some salt and chopped coriander leaves, mix well. Cook until the rice is 90% cooked in a medium low flame. At this stage, add the tossed mushroom with tomato and let it cook until the water gets evaporated fully. When done, open the lid and let it cool completely. Never mix the rice when hot. It makes the rice sticky. After 10 minutes mix gently and can add some ghee / butter now (optional) which gives a fine aroma. Garnish with chopped coriander leaves. Mushroom pulav / pilaf ready. Serve hot with raita or pickles.